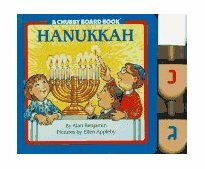 By Alan Benjamin The perfect way to introduce preschoolers to the Festival of Lights, this irresistible package comes with a chubby board book about Hanukkah and two wooden dreidels. The brightly illustrated book describes the many ways Hanukkah is celebrated. A Jewish family celebrates a happy Hanukkah in the 1950s. Nora leads her four siblings off to make gifts and latkes, spin the dreydel, and they all play until supper. After dinner, the children open presents and enjoy an extended family hug. Hafner's cartoon-lined figures are softened to good effect with watercolor and colored pencil, and the nighttime setting of the story is warm with candlelight and family delight. A final note gives a short explanation of the holiday. By Debbie Herman Here is a wonderful, beautifully illustrated book to help inspire Jewish children in celebration of Hanukkah, the festival of lights, while also telling boys and girls of all faiths the fascinating story and traditions connected with this festive holiday. The book's first part tells the story, taken from The Book of Maccabees and other historical sources, of how Antiochus of Syria invaded the land of Judea and forbade the Jews to perform their religious rites, which included lighting the menorah. The story goes on to tell how the Syrians were ultimately defeated and driven away by the Maccabees, and how the Temple of Jerusalem was restored and its menorah lighted and miraculously kept burning. This book's remaining pages describe the joyful Hanukkah rituals meant to commemorate the miracle of the menorah. Children read about the special foods for Hanukkah, learn to light Hanukkah candles, make lots of fun, innovative crafts, play dreidel with chocolate Gelt, and generally celebrate this joyous holiday. Includes sidebars with cool facts! By Steven Zorn Here's a profound collection of Hanukkah traditions and celebrations, including quotations, songs, blessings, stories, games, and recipes, contained within the pages of a Running Press Miniature Edition. Fun and informative, it makes a great gift for anyone, young or old, who celebrates the holiday or wants to learn about it. By Martin Lemelman This delightful board book for preschoolers offers an outstanding introduction to this fun-filled holiday. By Judy Bastyra Eight days of Hanukkah means eight days of fun! This book includes a wealth of ideas for fun things to make and do during the Hanukkah season, including baking a surprise Hanukkah cake, playing with a newly crafted dreidel, making and sending handmade holiday cards, creating a Menorah with specially decorated candles. A collection of fourteen crafts that are appropriate for the holiday, they include menorahs, dreidels, shield, helmet, dish and things to eat. Several will require adult assistance (melting crayons, heating the oven, applying varnish and all crafts that include use of the stove). Each has a list of the required materials and the directions and illustrations are adequate, especially since most will involve adults. By Phoebe Phillips My Favorite Hanukkah Book is part of a new series book-and-cassette packages by Smithmark. Each book comes with a 30-minute cassette that includes the stories and plays the songs from the 20-page board book. Included are the traditional story of Hanukkah, a story about a family's celebration, and plenty of activities and songs to make this an interactive and fun way for children to learn about the holiday. By Joanne Rocklin Daniel may be the middle child in the Bloom family, but he feels like the baby; his younger sister isn't afraid of the new dog, Rusty, next door, but Daniel is. To make matters worse, the dog's owner has invited the Blooms for Christmas cookies and hot chocolate. Daniel occupies himself before the dreaded visit by making Hanukkah presents for his family. The Blooms retell the ancient holiday story, light the candles, and cook traditional foods. On the night of the visit, Daniel accidentally drops the lucky dreidel he received as a gift. The dog scoops it up and places it at Daniel's feet, an overture of friendship that Daniel tentatively accepts. On the last night of the celebration, an ice storm knocks out the power and the Blooms' invited guests can't come, so they ask the other building residents, including Rusty, to share their Hanukkah meal. With refreshing, believable characters, this engaging story of a boy's fears, a supportive family, and a celebration that reflects traditional values is a great Hanukkah gift in itself. By Suzy-Jane Tanner It's the first night of Hanukkah, but where are the candles for the Menorah? The reader can search along in this lift-the-flap book while the children look in the toy chest, the closet and a wrapped gift box from grandma and grandpa. The characters are huggable, friendly-looking bears. The brief text, the clean and simple illustrations, and the interactive approach will appeal to young children. By Judith Hoffman Corwin Young readers will celebrate our cherished holidays with this sparkling series, filled with ideas and projects to add color and excitement to each season. Everyday materials and step-by-step illustrated directions will appeal to teachers, club leaders, and children. By Kay Greenberg Innovative Chanukah book comes alive with unique aromas from scented stickers! Children's book author, Kay Greenberg, has created a one of a kind holiday treasure. The aromas of Chanukah come alive in her new book, Josh and Alisha Celebrate Chanukah. Adults and children alike will enjoy this beautifully illustrated, full-color book filled with scents from chicken soup to chocolate. Readers will join Josh and Alisha as they excitedly prepare for Chanukah and celebrate the holiday with family and friends. The unique addition of specially-scented stickers to this holiday book stimulates the readers' powerful sense of smell and enhances the enjoyment of this delightful new book. The author created this sturdy book in both large print and Braille editions in remembrance of her visually impaired parents. She will donate a portion of the proceeds from books sold to further the publication of Braille books. Josh and Alisha Celebrate Chanukah has been selected by The National Braille Press as a November 1999 Book Club Selection. (Board Book Set) Just right for little hands, these colorful board books hit the spot for gift giving before or during Hanukah. Although each book has but six sides of rhymed information, Scharfstein manages to pack a lot in, as exemplified by I Am a Latke, which offers a quick, happy recipe ("Peel that potato!/ Snip, snip, snip!/ Chop that potato!/ Rip, rip, rip./ Add eggs,/ salt and onions too./ Mush it and squish it./Goo, goo, goo!"). 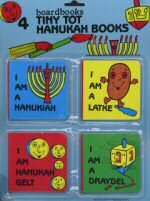 Other titles are I Am a Draydel, I Am Hanukah Gelt and I Am a Hanukiah (a menorah). Occasionally, outside background is helpful, such as knowing that "tzedakah" is charity giving, or why the Hanukiah is lit from right to left. Older children and parents may have to step in with the details.